Supplies – plastic bottle, vegetable oil, water, food coloring, effervescent antacid tablets - Be sure to read the ingredients list on the box. The tablets need to contain sodium bicarbonate and citric acid. Use an 8 oz. or 16 oz. empty plastic water bottle that has clear sides. 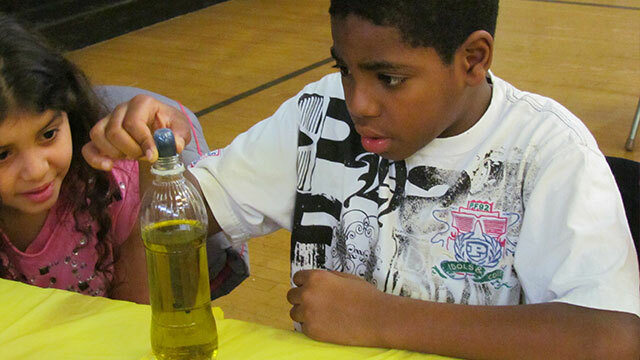 Using a light weight vegetable oil, carefully fill the bottle 2/3 full – no more. You need to leave room for water, and open room at the top. Now pour in about 1 ½ inches of water or to the area the bottle starts to curve - not to the top. What is happening? The water sinks down to the bottom of the bottle. Why does the water sink? Water is more dense, or heavier than oil, so it sinks to the bottom. Discuss what happens during an oil spill on the ocean. The oil is lighter and it stays on top of the ocean water, moving with the currents affecting birds, wildlife, and beaches. Add 8 drops of food color – one color.What is happening with the food coloring? Where is it? Did it mix with oil? 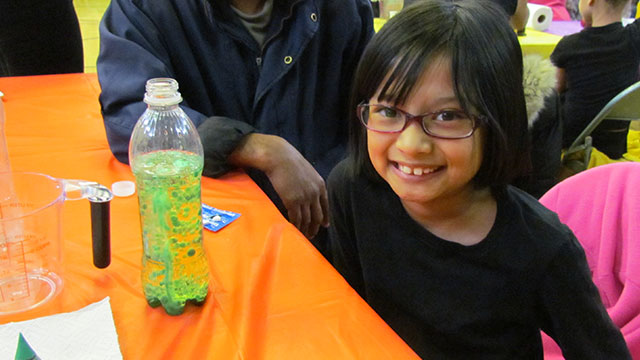 The food coloring also sinks to the bottom, as it is mostly water, and mixes with the water layer. Now take 1 effervescent antacid tablet. Break into several pieces. Try to break in half. Break each half again, break each piece again. Don’t worry if not all pieces are equal in size. Carefully drop one piece into bottle. What is happening? Bubbles begin to rise and sink. Why is it happening? The effervescent antacid is baking soda (sodium bicarbonate) and citric acid reacting to formsodium citrate and carbon dioxide gas, and this forms bubbles. The bubbles attach to colored water, and bubbles rise to top, burst and the colored water sinks back down under the oil. When the bubbles end, add another piece of effervescent antacid tablet. Continue until you have finished the 1st tablet. Now take a second tablet. Break it up again. Add a few drops of a different food coloring before you drop the pieces in the bottle. What happens to the color?